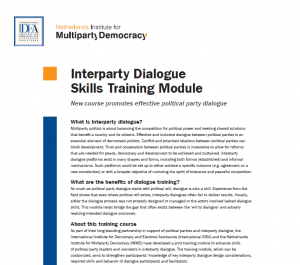 Together with International IDEA, we launched a new course that promotes effective political party dialogue. Experience from the field shows that even where political will exists, interparty dialogues often fail to deliver results. This module helps to bridge the gap that often exists between the ‘will to dialogue’ and actually realizing intended dialogue outcomes. Download the flyer to learn more about the module.